For existing users updating to Patch 7, please download an updated version of Better Inventory from the Files tab. Please note that the default asset archive lists have been changed again in Patch 7. Unfortunately, sResourceArchive2List, which I introduced in the first version of Better Inventory, has gone from being completely empty to becoming the most heavily changed asset list, often requiring users to manually update the list when a patch hits. 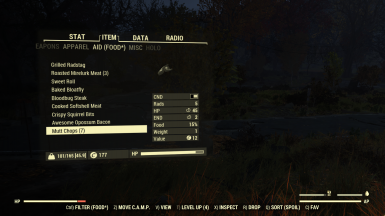 Unless you have other mods that need to be on this list, I now recommend completely removing this entry from your Fallout76Custom.ini file to reduce your maintenance burden. The above archive list has not been changed since Fallout 76's release and hopefully it will be stable for versions to come. 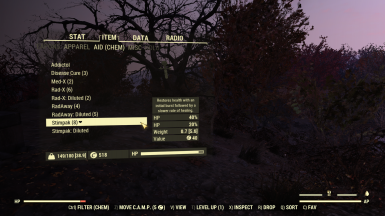 If you have other mods that need to be on other asset lists, do remember that you can always view accurate, up-to-date default settings for those lists in your Fallout 76 game directory, in Fallout76.ini. These may change with game updates. I think that the sResourceArchiveMisc was removed from the default .ini. Seems they moved "SeventySix - MiscClient.ba2" into SResourceArchiveList, and the cache list. Can you still generate the sResourceArchiveMisc resource list from the custom .ini? I have temporarily moved all my mods that I was loading from sResourceArchiveMisc back into sResourceArchive2List. 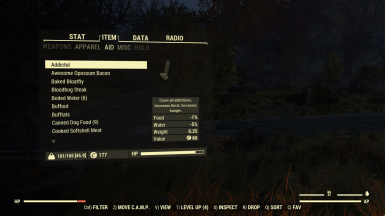 I really love this mod and is extremely convenient since the Aid category is the one filled with the most unique items for me. I was wondering, I don't really use the Food* and Drink* categories at all, would you be willing to make an alternate version of this mod that we can opt to install that removes those two sub-categories so we only have to scroll through four of them instead instead of six? Otherwise, keep up the awesome work, your an amazing person! 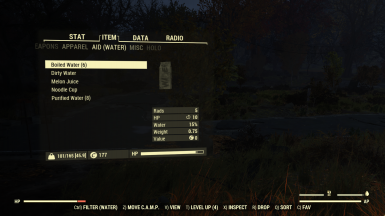 Using sResourceArchiveMisc instead of sResourceArchive2List for all mods will make re-textures not load. 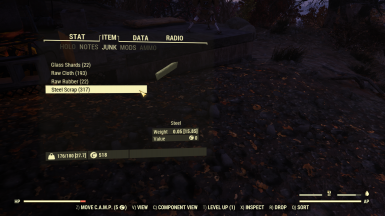 I think using sResourceArchiveMisc for certain mods, maybe sound mods, makes the game crash. I use SilentSuperSledge and when I moved all my mods to sResourceArchiveMisc and bring out my super sledge, my client crashes. I don't think we can move all mods to sResourceArchiveMisc. Maybe some that work can be moved there. I noticed this too. sResourceArchiveMisc does not work with re-texture mods, so I've gone back to the old method. Yeah, any mod that replaces sounds, textures or animations needs to be in sResourceArchive2List. The order the Bethesda-provided files are listed in there seems to matter, so put your replacement mods at the end of the list! Is it possible to add multilanguage for this mod? Never mind I read some comments and got it to work, sorry. Just started playing and this is the only mod I want to use. I downloaded the file and added it to the data file and then made a cusom.ini and still can't get this to work. Any help? 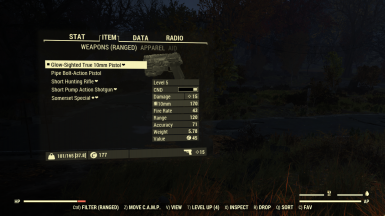 Broken-ish as of Patch 8, the new renaming/inspect window bugs out and removes the stats to the left after you use it. I am getting this issue too, but I have 0 mods installed, just thought you'd like to know. As far as I can tell is 'broken' in the core game. As we all know Beth does not require assistance to break their own stuff. 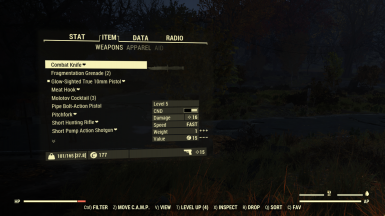 The aforementioned mod works like a charm) And as far as I can tell, Better Inventory works just fine on Patch 8 too, no issues at all. Heard Pack Rat bugs out though, so beware! No matter what I do I can't seem to fix the issue with the missing previews in the Atom Shop. I've even removed the custom ini file altogether and have no mods installed, but they still remain blank. Does anyone have any idea how I can fix this!? Are you using Ratmonkey's tagging mod? Sorry I lost my reading comprehension after 9pm I guess. Disregard my post. So, by that change, it should now be as follows? 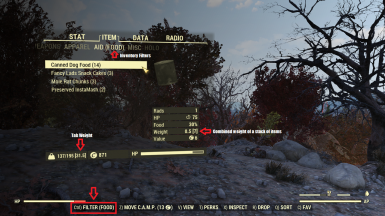 If you look at Fallout76.ini, it will give you the new ba2 load orders. 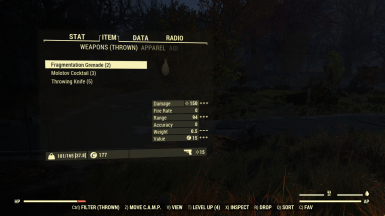 Most of the stuff got changed in sResourceArchive2List, so I you have that line unmodified in your custom ini, you should replace it with the one from Fallout76.ini. If you are loading mods at the end of that line in custom ini, re-add them to the line that you copy over from the normal game ini. I'm only using sResourceArchive2List in custom (no misc anymore). All mods seem to load fine at the end of that line in custom. If you are building loose files with Baka, you may also want to look for updates of those files and rebuild your Baka file. In response to post #69205461. #69225741, #69230731, #69231926 are all replies on the same post. Elfykins wrote: No matter what I do I can't seem to fix the issue with the missing previews in the Atom Shop. I've even removed the custom ini file altogether and have no mods installed, but they still remain blank. Does anyone have any idea how I can fix this!? linksword01 wrote: Are you using Ratmonkey's tagging mod?